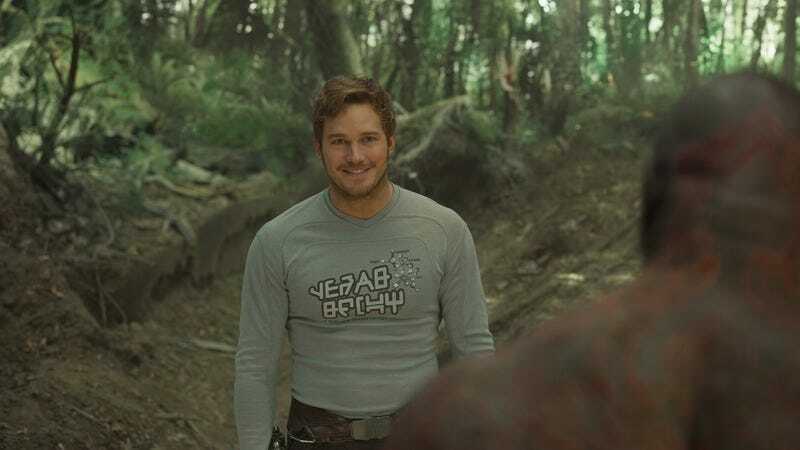 Outdoing even the high box office expectations set by the first Guardians Of The Galaxy, James Gunn’s Marvel-franchised goofball space adventure Guardians Of The Galaxy Vol. 2 took the top spot this weekend with an estimated $145 million. This spectacular opening accounted for almost 80% of the domestic Top 10 gross, leaving runner-up The Fate Of The Furious with a measly $8.6 million. But don’t cry too much for The Fate Of The Furious; the film has been in theaters for four weeks, and has already made about $207 million in the United States. The message is clear: audiences want 136-minute, PG-13-rated movies about misfit outlaws (and the ex-antagonists who join forces with them) thwarting evil plans and endlessly harping on about “family,” preferably with Vin Diesel in a growl-heavy role. Coming in 2018: Riddick And Friends! What was a huge weekend for Guardians was a middling-to-miserable one for everyone else, though the mindbogglingly successful The Boss Baby actually went up a spot, going from No. 4 to No. 3 with about $6.2 million. (If it’s any sign of how much Guardians dominated this weekend’s receipts, Boss Baby actually made more money last weekend for a lower spot.) Meanwhile, How To Be A Latin Lover dropped to No. 4 with $5.2 million, while Beauty And The Beast took No. 5 with $4.9 million. But these are all movies you, regular Weekend Box Office readers, have been hearing about for weeks. It’s likely that you’re wondering, “Gee, how did the non-Marvel new releases do this weekend?” The answer is that they didn’t do well. Coming an astronomically distant second, Oren Moverman’s The Dinner took the No. 12 spot with $755,348—in wide release, to boot. In fact, Guardians’ massive opening also gave it far and away the highest per theater average of the weekend (estimated at $33,368), the usual metric of success for indie, arthouse, and speciality releases. Oddly enough, the second best such average was recorded by a bona fide classic of a very different strain of sci-fi: Andrei Tarkovsky’s 1979 masterpiece Stalker, which is starting to tour in a new restoration, made $19,785 in a single theater. Close behind was Azazel Jacobs’ The Lovers, which averaged a very healthy $17,603 across four screens. Meanwhile, the underdog boxing biopic Chuck, which also opened in four theaters, averaged $10,104. Expect all of these expand into more theaters in the coming weeks. It is in the limited release category that we find the true hopeless losers of the weekend. 3 Generations, the long-delayed Weinstein release (formerly titled About Ray) that was pulled from the calendar just days before it was set originally set to open in theaters in 2015, finally arrived in a re-edited version, averaging just $3,353 across six screens. That’s still better than The Dinner—whose miscalculated release in over 500 theaters saw it averaging just $1,496. But pour one out for Laura Poitras’ Risk, the troubled (and also significantly re-worked) companion piece to her Oscar-winning documentary Citizenfour. The film, which was in the editing room until a few weeks ago, failed to tap into the zeitgeist the way its predecessor had, despite largely positive reviews. (Well, everywhere except here.) While Citizenfour opened to $125,321 in just five theaters and ended up earning $2.8 million—a lot of money for a documentary—Risk grossed an estimated $75,179 in 34 theaters, for an opening weekend average of $2,211.